Based out of Waverly, MN, Hose and Fitting Supply is a leading industrial fitting resource. Our premier company specializes in push to connect pneumatic fittings for all of your hose needs. Pneumatic push to connect fittings allow you to effectively and efficiently convey compressed air through your hose as desired. In addition, push fittings are manually able to connect and disconnect with ease, making them simple to use on a regular basis. Hose and Fitting Supply features many different push to connect options to choose from. From the Swivel Elbow - Tube X NPT and the 45 Degree Swivel Elbow - Tube X NPT to the Male Triple Union- Tube X NPT and the Female Banjo- Tube X NPT, you will find it all with us! 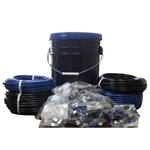 In addition to push to connect fitting products, Hose and Fitting Supply also carries and stocks a wide range of additional hose items including valves, pressure gauges, clamps, tubing and crimp fittings to meet all of your needs. Shop with us today and take advantage of everyday low prices for some of the best deals in the industry!